Covering both theory and practical topics, Fundamentals of Wireless Communication Engineering Technologies offers a sound survey of the major industry-relevant aspects of wireless communication engineering technologies. Divided into four main sections, the book examines RF, antennas, and propagation; wireless access technologies; network and service architectures; and other topics, such as network management and security, policies and regulations, and facilities infrastructure. Helpful cross-references are placed throughout the text, offering additional information where needed. 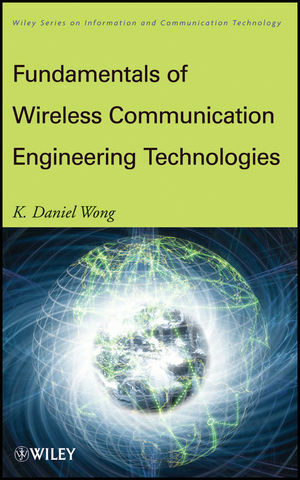 With a holistic and well-organized overview of wireless communications, Fundamentals of Wireless Communication Engineering Technologies is an invaluable resource for anyone interested in taking the WCET exam, as well as practicing engineers, professors, and students seeking to increase their knowledge of wireless communication engineering technologies. K. Daniel Wong, Phd (Stanford), is a member of the Practice Analysis Task Force (PATF), which was organized by the IEEE Communications Society and created the initial list of topics for the WCET. After teaching at the Malaysia University of Science and Technology, he started his own training and consulting company in wireless networking and software. He often teaches a variety of highly rated and well received courses on wireless communications. In addition, he has contributed to numerous books, journal and magazine papers, and conference papers.